A recent study conducted by researchers from “The Francis Crick Institute”, and published by Immunity reveals that tumor cell PD-L1 expression can be driven by oncogenic RAS pathway activation. PD-L1 (programmed death 1 ligand) is a molecule that the body uses for limiting autoimmune-related damage to normal tissues and that was found to be upregulated on cancer cells, allowing the tumor to evade the immune system. Therapies with antibodies targeting PD-1 and its ligands have been shown to be associated with remarkable response rates in various cancers. However, as anti-PD-1 immunotherapies are effective in only a minority of cancer patients, there is a great need for reliable biomarkers of patient response. 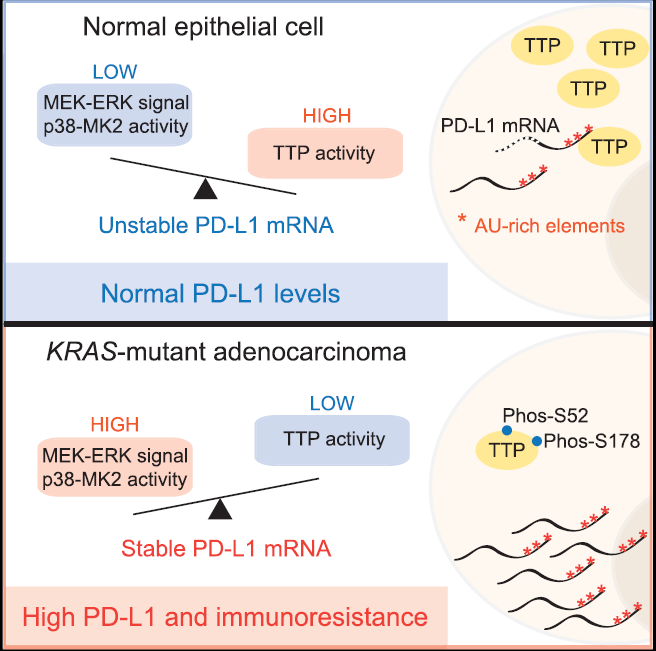 To do so, it is critical to understand the signaling pathways that dictate tumor cell PD-L1 expression. In their study, the researchers found that oncogenic RAS signaling can upregulate tumor cell PD-L1 expression. The mechanism of this process is involving an increase in PD-L1 mRNA stability via modulation of the AU-rich element-binding protein Tristetraprolin (TTP). TTP negatively regulates PD-L1 expression through AU-rich elements in the 30 UTR of PD-L1 mRNA. While MEK signaling downstream of RAS leads to phosphorylation and inhibition of TTP by the kinase MK2. The report demonstrates that In vivo, restoration of TTP expression enhances anti-tumor immunity dependent on degradation of PD-L1 mRNA, providing new therapeutic opportunities for effective combination therapies targeting RAS, or RAS effector proteins.